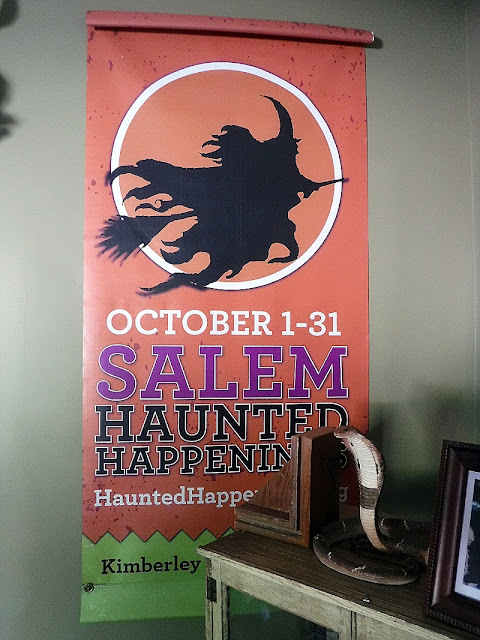 October 6, 2016 — We lived in Salem for 31 straight days for A Season with the Witch. On average, I was in a gift shop of some sort at least twice a day. They’re all over the place in the city. Yet I did not buy a single souvenir. It wasn’t purposeful on my part. I’m not sure why I didn’t buy a thousand things with witches on them. Maybe it was because I knew I was documenting the whole experience for the book, so I didn’t need anything to remember it by. I don’t know. I just didn’t buy any souvenirs. Almost got a tattoo, though: 1692 underlined by a witch broom. But that’s not to say I didn’t walk out of that city without any mementos. I ended up with quite a few. Here are my eleven favorites, many of which have longer stories behind them that I go into in the book. This crystal has been purified and energized with positive energy by a Witch. I know, because I was involved in the ceremony. I spent an entire chapter with the Real Witches of Essex County, interviewing them about their experiences, participating in their rituals and their readings. 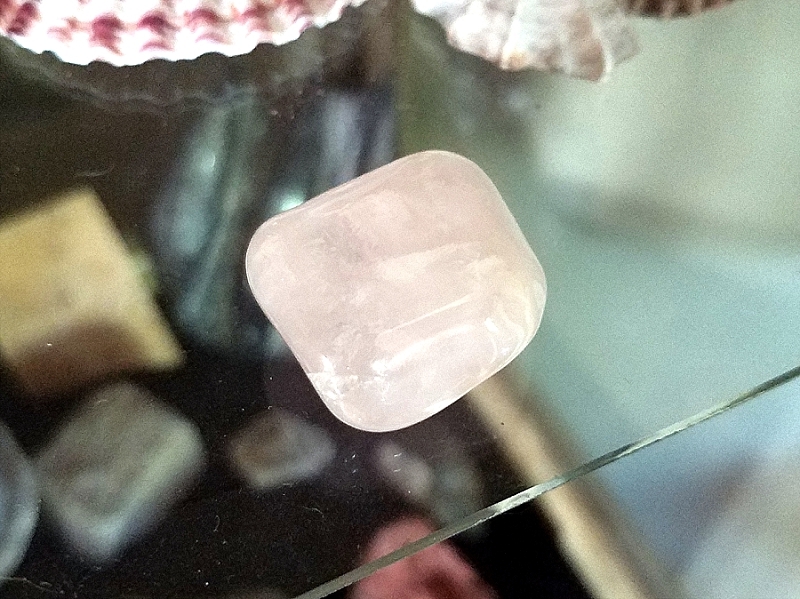 I was told to keep this particular crystal in my left pocket or in a left drawer because that is the side which pulls in good things from the universe. If you put it on the right side, it will leak them out. I keep in on a shelf in my study. It’s on the left side of the room depending on which way you’re facing. This is a shirt from a restaurant called Rockafellas, right on the Essex Street Pedestrian Mall. 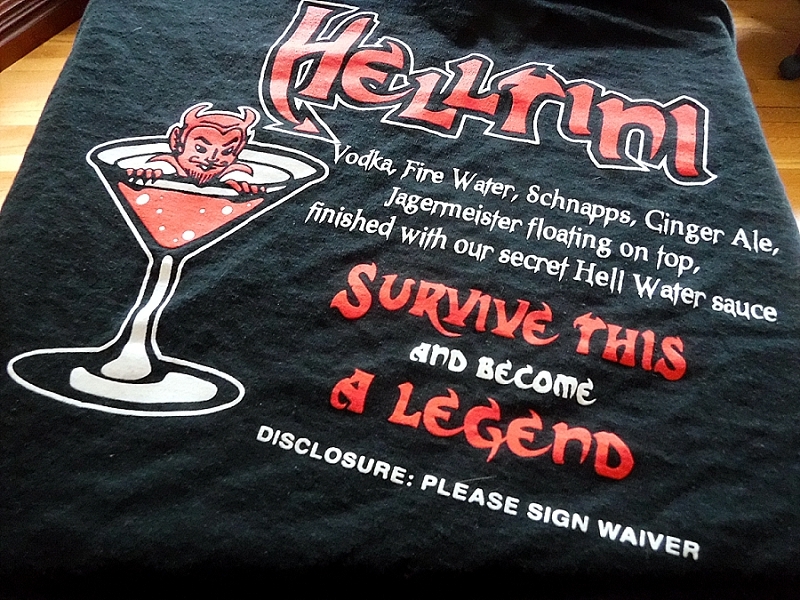 To get this shirt, you have to drink something called a Helltini, which is a red concoction of vodka, fire water, schnapps, ginger ale, Jagermeister, and a “secret Hell Water” sauce. Basically, the drink is spicy. One night, we had a few friends in town, so we went to Rockafellas. After getting tipsy on candy corn-tinis, somebody got the bright idea for us all to do this. We all signed wavers. We all finished them. We all got shirts. We all threw them on. We all marched out to the Bewitched statue and got our photo together. And as much as I like the image of a tiny devil in a martini glass, I haven’t been able to wear mine since that night, I think out of some sort of PTSD, not for the Helltini really, but for that entire night. I don’t collect autographs. 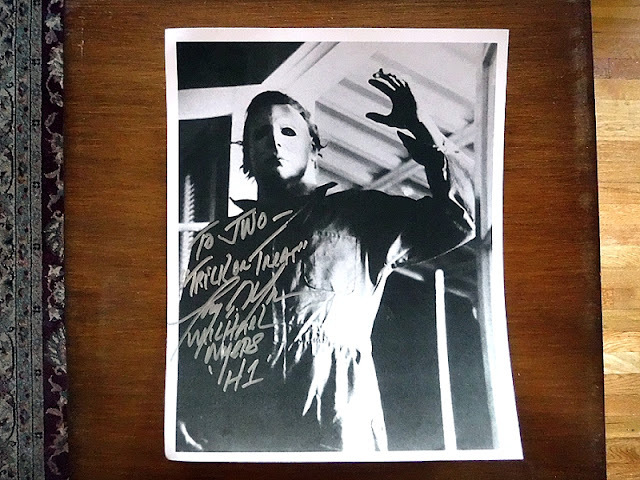 But I had to have this one from Tony Moran, who played the human face of Michael Myers at the end of John Carpenter’s original Halloween. 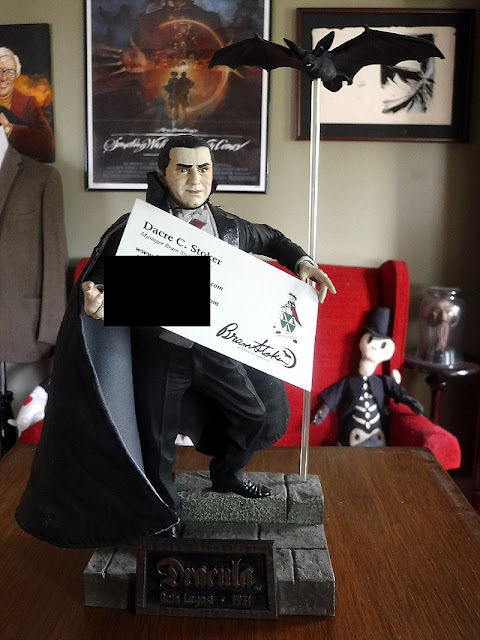 He was in Salem doing an appearance at Count Orlock’s Nightmare Gallery, and I got to sit down with him and interview him for the book while Halloween music played on the speakers above us and horror fans clustered around to meet him. So let me recap that. 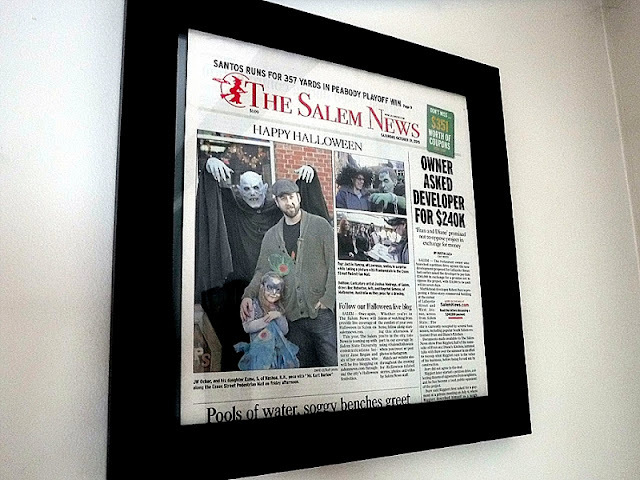 I was interviewing Michael Myers in Salem outside of a monster museum to the sounds of Elvira and Rocky Horror and Michael Jackson’s Thriller. It was one of the more Halloween moments in a month filled with them. Dacre is the great grand-nephew of Bram Stoker, the author of Dracula. And at some point, Dacre got really into it and starting writing books about his famous forebear and visiting sites connected to him. He also manages the Stoker estate. He was in town to give a talk about Dracula sites, and Lindsey and I got to sit down with him afterwards and compare notes on our weird travels. At some point he slipped me a business card, and now I’m jazzed to have a business card of one of Bram’s blood. On Halloween morning, I went out to get newspapers for us to spread out on the kitchen table so that we could carve our pumpkins that we had gone through Herculean efforts to find. What I found was that me and my oldest daughter made the front page…of the Halloween issue…of the Salem newspaper. That might be my supreme Halloween moment of all time. 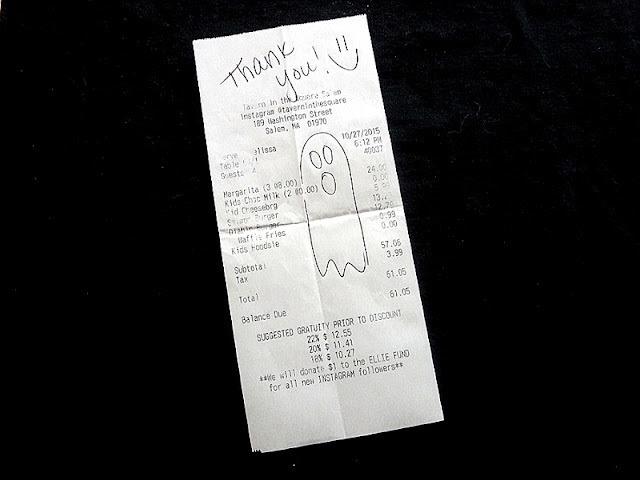 This should have ended up being a piece of litter, but because my waitress at the Tavern on the Green drew a ghost on it, it’s now one of my favorite Salem mementos. This was my spooky Bible for the month. In it was a schedule for all the official activities throughout the month, advertisements for the attractions, and everything else I needed to navigate Halloween in Salem. Immediately upon arriving in Salem, I visited Wicked Good Books on the Essex Street Pedestrian Mall and bought a journal for me to write all my notes in. 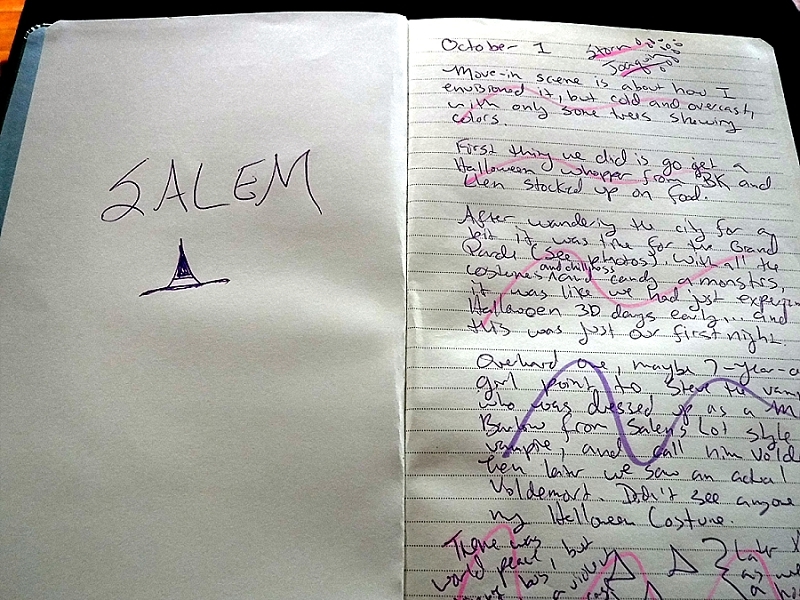 To get in all the Halloween I was experiencing, I really needed a camera crew to follow me around, but since I didn’t have that, this journal did fine. I’d hit a bar late at night, order up a Halloween-themed cocktail, and jot down all my notes for the day. So this is basically A Season with the Witch: The Private Version. These works of art are by oldest daughter Esme, who was five years old during our stay in Salem. She drew them for me one calm night while I was watching a movie or typing up some notes. Probably both. She made sure I noted the severed head in the Headless Horseman photo. 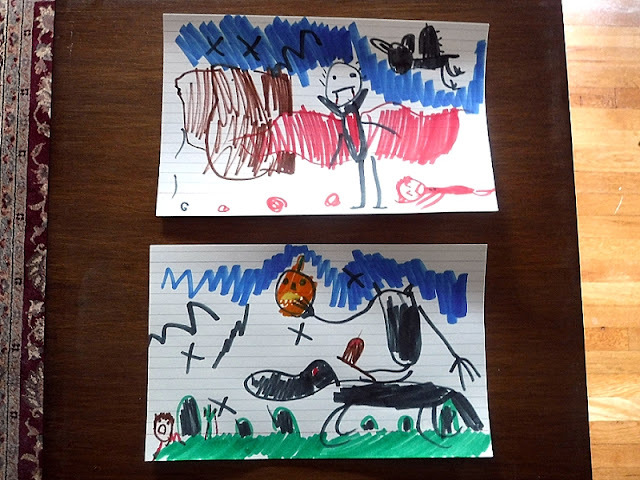 She drew a lot of monsters during that month, including the ones she saw around town. Honestly, I should have just had her illustrate the book. And then removed all the text. And my byline. 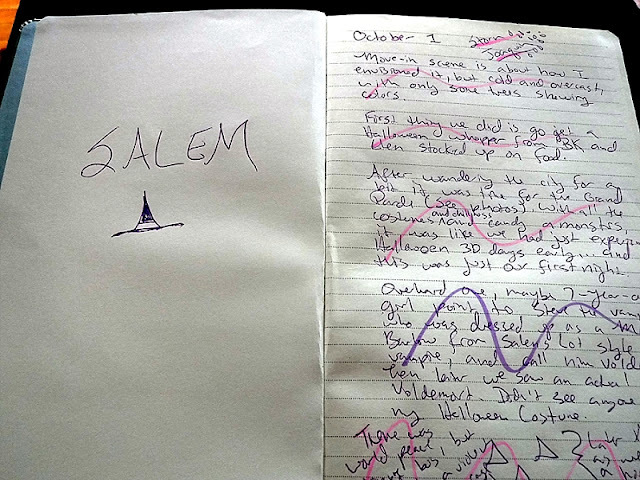 And then re-titled it: Salem Thought the Eyes of a Child, dedicated to her future psychiatrists. You haven’t done Halloween, unless you’ve partied with Witches. In the book, I documented our entire, exhausting, exhilarating Halloween day, some of which we spent at the Salem Witches’ Halloween Ball at the Hawthorne Hotel. 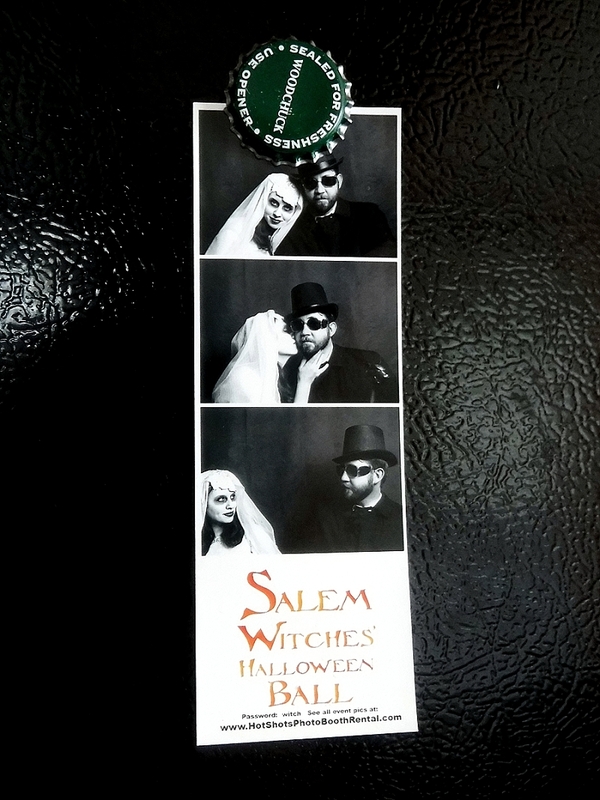 This is Lindsey and I in costume taking advantage of the event’s photo booth. I don’t know why we didn’t do a scary pose. You have to think fast in a photo booth. This is without a doubt my prized Salem possession (although only slightly above my ghost receipt). 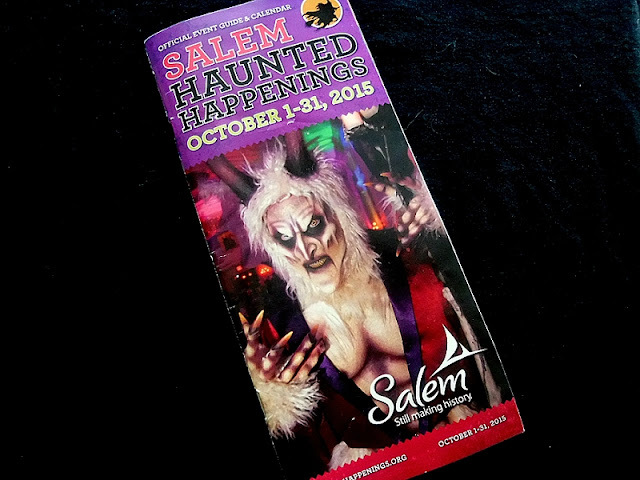 The entire month of Halloween celebration in Salem is called Haunted Happenings, the history of which I detail in the book. 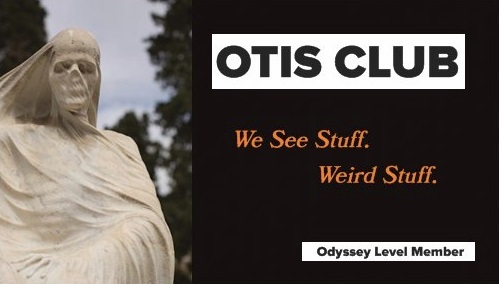 But every October, they erect these vinyl banners on just about every light pole. When I interviewed the person in charge of Destination Salem, the city’s tourist organization, she gave me one from the previous year right off her office wall, thus ensuring she got a glowing depiction in the book.